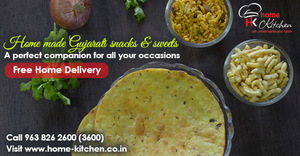 Now with Home-Kitchen.co.in you can also order your favorite Gujarati sweets online. The best part of ordering with Home-Kitchen.co.in is that the sweets are home made by using pure Ghee. Home-Kitchen.co.in also serves authentic and mouth watering Gujarati farsan online.